So much of entertainment comes via screens nowadays, but when you’re a kid, there are few things as thrilling as getting together with a group of friends and going on an adventure built by your imaginations. 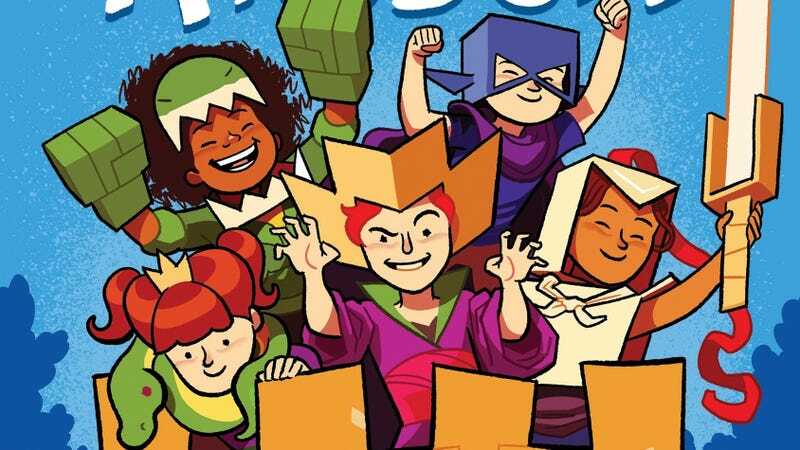 The Cardboard Kingdom, a new children’s graphic novel from Knopf Books, has cartoonist Chad Sell working with 10 different writers to explore this idea with a young group of neighborhood kids who create magical worlds and characters out of cardboard. It’s an inclusive collection of short stories that explores different aspects of childhood and growing up with compassion, humor, and playfulness, and Sell ties all these narratives together with vibrant, expressive artwork. Sell is a friend of The A.V. Club—he drew a short comic for 2014’s Comics Week—and while he’s best known for his stunning portraits of RuPaul’s Drag Race contestants, The Cardboard Kingdom showcases how well his animated art style works for stories geared toward a younger audience. This exclusive preview of The Cardboard Kingdom, on sale June 5, features the entirety of “The Huntress,” a story by Sell and David DeMeo that follows two siblings as they make friends in their new neighborhood. The personality of these kids leaps off the page, and Sell’s experience condensing big drag characters into single images brings a lot of life to the cast of this graphic novel. The pair of illustrations at the end of this excerpt shows how the kids’ activities are reinterpreted with full-on fantasy visuals when they really get in the zone, but “The Huntress” emphasizes the reality of the world by not making that shift and keeping the cardboard. Those cardboard costumes are simple enough that kids can recreate them on their own (if they can be trusted with a pair of scissors), and the interactive element of The Cardboard Kingdom makes it an even more engaging book for both kids and adults who want to tap into the joys of youth.